Entry Restrictions: The Promotion is open entrants of the July-August 2018 survey, aged 18 years or over, excluding those persons listed in clause 3 of the Conditions of Entry. Promotion Period: The Promotion period will be valid from 12:01am on 28th of July 2018 (AEST) until 11:59pm on 13th August 2018 (AEST). Verification Requirements: The Promoter reserves the right, at any time, to verify the validity of entries and entrants (including an entrant’s identity, age and place of residence) and to disqualify any entrant who submits an entry that is not in accordance with these Terms and Conditions or who tampers with the entry process. Errors and omissions may be accepted at the Promoter’s discretion. Failure by the Promoter to enforce any of its rights at any stage does not constitute a waiver of those rights. If there is a dispute as to the identity of an entrant, the Promoter reserves the right, in its sole discretion, to determine the identity of the entrant. Entry Procedure: To enter, go to the Luxury Escapes LE TV Competition page (https://luxuryescapes.com/magazine/tvcompetition/) and complete the survey. To win, contestants must Watch Luxury Escapes: The World’s Best Holidays on Saturday 28th July, 4th August & 11 August and answer questions three (3) questions relevant to those episodes correctly as well as the final question ‘What are your top 3 bucket-list destinations and why?’. Maximum Number of Entries: One entry permitted per household. Location: Luxury Escapes – Level 1, The New Yorker Building, 50-56 York Street, South Melbourne VIC 3205. Judging Method: Entrants who answer the three (3) questions relevant to the episodes will be shortlisted. Then, the judges will determine the best answer to the question ‘What are your top 3 bucket-list destinations and why?’ will be based on merit as determined at the judge’s sole discretion. No correspondence will be entered into with participants. 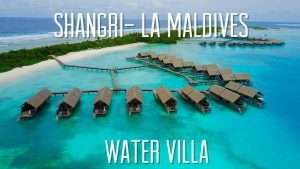 Prize Details: The winner will receive a 5 night accommodation package in a Water Villa at Shangri-La VIllingili Resort & Spa with Luxury Escapes inclusions subject to the specific Terms and Conditions of the Package (“Fine Print”) and General Terms and Conditions (found at https://luxuryescapes.com/magazine/win-a-stay-at-shangrila-maldives/). Stay subject to availability of dates and is valid for travel up until 22 December 2018. Surcharges may apply to certain dates as outlined in the Fine Print. Prize does not include flights. Further, unless expressly stated all other expenses are the responsibility of the winner including but not limited to spending money, visas, transport to and from departure and arrival points, incidentals, mini-bar, laundry, room service, telephone calls, additional activities, gratuities, services charges, travel insurance, pre and post accommodation, optional activities or excursions and all other ancillary costs. Notification of Winner: The winner will be notified via email by 5:00pm (AEST) on 14th August 2018. Prize Claim Date: Prize must be claimed by 5:00pm (AEST) on 18th August 2018. Unclaimed Prize Arrangements: If the Prize is not claimed by the Prize Claim Date or a judged entrant is deemed invalid in accordance with the Conditions of Entry, further judging will not take place. Directors, management, employees and contractors of the Promoter and those of any agencies, retailers and suppliers associated with this Promotion and the immediate family members of these people are ineligible to enter. “Immediate family member” means spouse, parent, natural or adopted child, and sibling (whether natural or adopted by a parent), whether or not they live in the same household as the director, manger, employee, officer or contractor. To enter the Promotion, entrants must complete the Entry Procedure and comply with all other applicable requirements during the Promotion Period. Entries must be submitted in accordance with the Entry Procedure and will not be accepted in any other form. No responsibility is accepted by the Promoter for late, lost, misdirected, ineligible or indecipherable entries (including lost, stolen, forged, defaced or damaged proof of entry or things required by the Verification Requirements). The Promoter and/or its representatives may conduct security and/or verification checks (including enforcement of the Verification Requirements) in their absolute discretion to determine the bona fides of an entrant’s eligibility to enter the Promotion. Ineligible entries will be deemed to be invalid at the sole discretion of the promoters. This competition is a game of skill, and chance plays no part in the results of this competition. Entries will be judged the answer given which will be determined at the judge’s sole discretion. The Promoters decision in relation to any aspect of this competition is final and negotiations will not be entered into. Where an entry is deemed invalid (at the Promoter’s absolute discretion) prior to the Prize Claim Date, the Promoter may determine a new winner in accordance with the Unclaimed Prize Arrangements. Entries must be received by the Promoter and will be deemed to have been received at the time of receipt by the Promoter. Online entries are deemed to have been received at the time of receipt into the Promotion database and not at the time of transmission by the entrant. The draw will be conducted in accordance with the Draw / Judging Details. The Prize is specified in the Prize Details. The Prize is subject to any restrictions specified in the Schedule. The Total Prize Pool is specified in the Schedule. The Prize is not transferable or exchangeable and cannot be taken as cash. If the Prize is unavailable for any reason, the Promoter reserves the right to substitute another prize of equal or greater value for that prize, or element of it, subject to the approval of any relevant authority. The Promoter and its representatives will not be liable for any damage to or delay in transit of prizes. The Promoter is not responsible for any problems or technical malfunction of any telephone network or lines, computer on-line systems, communication network, computer equipment, software, technical problems or traffic congestion on the Internet or at any web site, or any combination thereof, including any error, omission, alteration, tampering, deletion, theft destruction, transmission interruption, communications failure or otherwise, any injury or damage to entries or to participants’ or any other person’s computer related to or resulting from participation in or downloading any materials in this Promotion. If the Promotion is not capable of being conducted due to circumstances beyond the Promoter’s control, including due to any technical or communications problems, the Promoter reserves the right to amend, suspend or cancel the Promotion subject to approval from any relevant authority. B. engages in conduct in relation to this Promotion which is misleading, deceptive, fraudulent or damaging to the Promoter’s goodwill or reputation. 20. The Promoter and its agencies and representatives associated with this Promotion will not be liable for any loss (including but not limited to indirect or consequential loss), damage or personal injury which is suffered or sustained (including without limitation to that caused by any person’s negligence) relating to this Promotion or the awarding or taking of the prizes except for any liability which cannot be excluded by law (in which case liability is limited to the minimum amount allowable by law). 21. The Promoter may use any personal information entrants provide in connection with this Promotion for the purpose of the Promotion, and also in advertisements, publications, media statements and other promotional material associated with the Promotion. The Promoter may disclose the information for those purposes to its related bodies corporate and contractors. If entrants do not provide the information requested, they will not be able to enter the Promotion. The Promoter is bound by the National Privacy Principles contained in the Privacy Act 1988 (Cth). To request access to, or to update, personal information the Promoter holds about them, entrants can contact the office of the Promoter (an administrative fee may be imposed to access personal information).